Have you ever faced the tediousness of a long wiring job, where keystone jacks number in the hundreds and every single one of them needs to be punched down? Hand strain is common, fatigue can cause inconsistent punchdowns, and both can lead to wasted time and issues with the quality of your punchdown terminations. 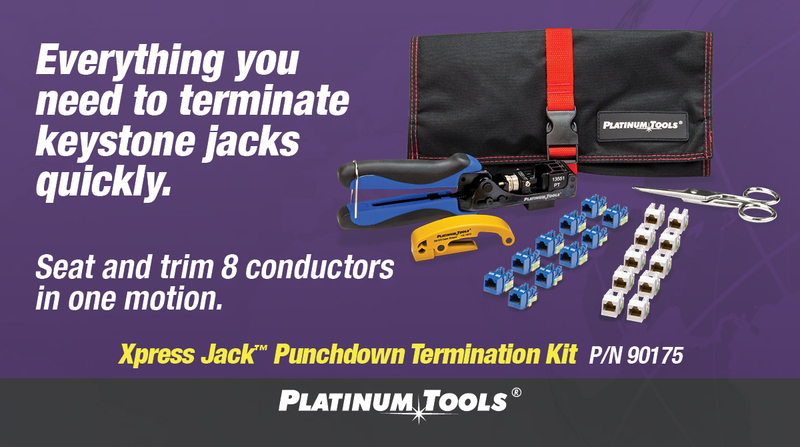 The purpose of the Xpress Jack® Punchdown Termination Kit is to eliminate hand strain and inconsistent punchdowns to make keystone jack termination easier than ever. The kit includes the Cat5/6 Cable Jacket Stripper and the Scissor-Run Electrician’s Scissors to prep your cable, ten blue and ten white Keystone Cat6 110 Jacks to get your project started, and the Xpress Jack Punchdown Tool to terminate your Keystone Jacks in one quick, easy motion. The Xpress Jack Punchdown tool is made to last with its heavy duty all carbon tool steel construction and a rust-resistant black oxide finish. Unlike a punchdown tool, however, it’s easier to use. All you need to do is insert the unterminated, wired keystone jack into the die cavity of the Xpress Jack, then press the Xpress Jack’s handles together. The handles are made to be operated with one hand and are ergonomically designed with a comfortable grip to reduce hand stress on large jobs. Upon termination, the Xpress Jack seats and trims all eight conductors in one smooth motion, saving time and energy and reducing the likelihood of inconsistent terminations, damage to property, and even personal injury.